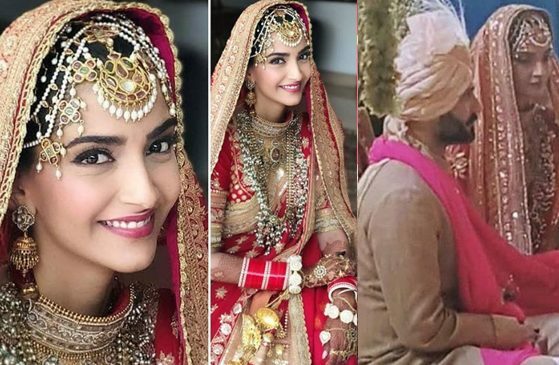 On 8 May 2018, Bollywood’s fashionista Sonam Kapoor got married to her long-time boyfriend Anand Ahuja in a star-studded wedding event. Bollywood stalwarts, be it Karan Johar, Kareena Kapoor, Khans, Bachans or Shipa Shetty, everyone danced to the tune of happiness. According to a source, Sonam Kapoor and Anand Ahuja were introduced to each other by their mutual friend Pernia Qureshi in 2014. Pernia was Sonam’s hairstylist then and was also good friends with Anand. The groom proposed to Sonam within a month of their meeting and the two have been together ever since. Anand made the first public appearance with Sonam in 2016 at Akshay Kumar’s party for Hollywood star Will Smith. They have often been spotted together at events and parties and have even gone on family vacations together. Though the two never confirmed their relationship to press, but their social media PDA proved to be a give-away for their fans. Sonam took no time to add Ahuja to her name for everybody to know that she married the love of her life.The bride has been showered with numerous pre-wedding gifts which she shared with her friends and fans on social media. Ranbir Kapoor’s sister Riddhima Kapoor Sahni, has gifted Sonam an emerald bracelet that she has herself designed. Sonam shared a boomerang video in her Instagram story that has her sporting the lovely bracelet. Following a gala mehendi and sangeet ceremony, the much-talked about B-town wedding took place at Sonam’s aunt’s mansion Rockdale. Right from Kareena Kapoor Khan to Katrina Kaif to Karan Johar, many B-town celebrities made their presence felt on the big day. The grand wedding was a three-day affair. Mehendi ceremony took place on May 7 at Sonam’s pad in Bandra on Monday. The wedding of the Khoobsurat actor saw the who’s who of Bollywood in attendance. Sonam is the first cousin of Jhanvi Kapoor, late Sridevi’s daughter. After the couple took the wedding vows, the Kapoor and the Ahuja family have given a grand wedding reception in the evening at The Leela Hotel, Mumbai.